To the uninitiated, German military symbols appearing on documents, maps, orders-of-battle, and throughout postwar German WWII military literature, can appear indecipherable. Yet an understanding of their meaning is key to being able to seriously read and research all aspects of the WWII German Armed Forces. 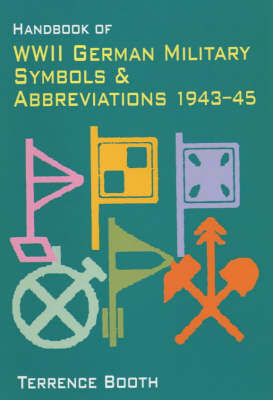 This book aims to provide the reader with a clear and comprehensive reference to these symbols, as seen in photos, tables of organization and maps for the period May 1943 onwards. The first two parts of the book feature an overview of how the German Armed Forces used the symbols in the field. Parts III, IV and V deal with specific forms and categories of symbols used. The format used throughout has been to provide an image of the symbol, accompanied by the relevant German term and its English translation, along with any pertinent information that will aid the reader s understanding of the symbol and the unit that it represented. The final part of the book, containing a list of over 500 abbreviations and their German terms, supplemented by English translations, should prove invaluable to any reader who has more than a passing interest in the Second World War German Armed Forces.- The only English-language book available on this subject; a new book, NOT a photocopied reprint!- All images computer-enhanced for crystal-clear reproduction- Ideal reference for modelers and all those who take an active interest in the WWII German Armed Forces- A thoroughly researched guide to a little-known subject- Over 800 symbols illustrated; over 1,000 German terms & abbreviations translated into English.REVIEWS "This book is absolutely the last word on the subject, and will be all you will ever need." Wargames Illustrated"It is doubtful if anyone could find a symbol of the unit that has not been included in this book Highly recommended." Formation Sign"This is an absolute must for the non-German speaker who wants to try to deal with original source documents." George Nafziger"